Calculate the tile material needed for your floor, wall, or backsplash project by entering your project dimensions. Estimate the cost of materials by entering the price per below. Tile is a very popular option for flooring and backsplash projects because they are durable, easy to clean, and have endless design possibilities. Because tiles come in so many sizes and installed patterns are infinitely variable, it can be more complicated to accurately estimate how much tiling you will need than for other floor and wall coverings. The first step is to know how large of an area you want to cover. Since most material and many work estimates are given in square feet, use that unit when measuring room or wall lengths and widths. To measure like a pro, learn pro tips for measuring irregular rooms. Measure smaller areas individually. Then, add all your areas together. Plug the total lengths and widths into the calculator above. Use the result to order your tiles, keeping in mind that ordering an extra 10% to 20% is a good idea to allow for cuts and waste. Or, give the quantity to your contractor for an estimate. To find the area of the room yourself, multiply the width by the length of the floor or wall in feet to find square footage. Easily find the project square footage using our square footage calculator. Tiles come in many sizes and costs vary widely. Some tiles can be purchased individually or in individual sheets and some by the box. Boxes and sheets of tile cover different square foot areas as well. If you know what tiles you would like to use, enter the size into the calculator above. Don’t forget to enter how much square footage the box covers if you use that method. If you are using sheets, enter the sheet size. The calculator will also give you a cost estimate if you know the price per tile, sheet, or box. To do this calculation yourself, take your tile size in square inches and divide it by 144 (12in. x 12in.). This gives you the tile size in sq. ft.
Then divide the total area by the tile size in sq. ft. This will give you the number of tiles you need for your space. For boxes, divide the area by the sq. ft. coverage for the box. 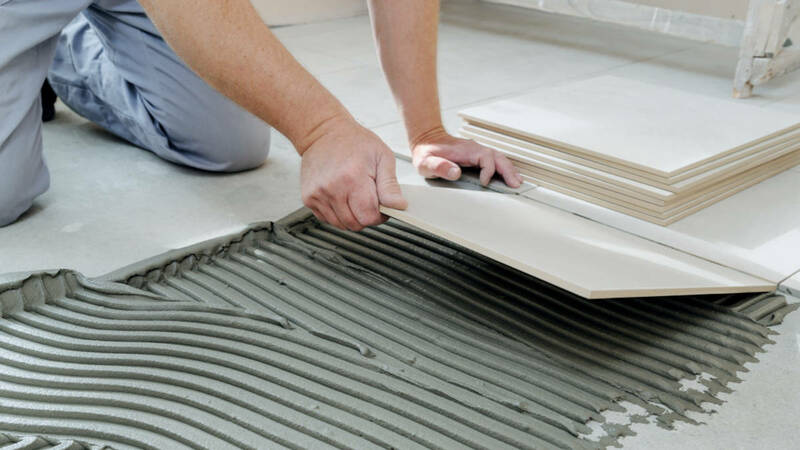 To account for cuts and breakage, we suggest ordering 10% to 20% to the total tile quantity ordered. For example, to estimate tile for a kitchen backsplash area that is 12’ long and 18” deep using a 4″ x 4″ tile. Convert inches to feet: 18” ÷ 12 = 1.5 ft.
Find total area: 1.5’ × 12’ = 18 sq. ft. Convert tile size to sq. ft.: (4” × 4”) ÷ 144 = 0.111 sq. ft. Kitchen and bath tile is often installed in a pattern using different sizes. To estimate the amount of tile needed you can find the square footage of the repeating pattern and then estimate how many instances of that pattern are needed, then multiply by the number needed to create the pattern. For instance, if your pattern requires one 8″x12″ and one 6″x8″ then add the square footage of both tiles together to find the square footage of the pattern. Then divide the floor ft2 by the tile ft2. Illustration shows how to find the tiles needed for a pattern and how to find the square footage of the pattern. Some layout patterns that use the same size tiles may also influence how much material will be required since there will be varying amounts of cuts and waste when using different layouts. While some patterns result in more waste than others, a good rule of thumb is when installing tile at an angle, consider ordering 20% additional material to account for more cuts and waste. Choose thinset or mastic depending on your tiling application. You will likely want to use thinset for most flooring applications while you’ll probably choose mastic when doing wall tile. Calculating how much thinset or mastic you need requires choosing a trowel size for your project. Larger and smaller notch trowels require more or less thinset. Different thinset and mastic products will cover different amounts, and most will have a coverage chart on the bag indicating how many square feet the product covers for your trowel. If you don’t have access to the coverage chart, you can learn how to how to estimate thinset material. In addition to tile and thinset, you’ll need some additional material for your project. First is a solid backer board to properly support the surface and prevent cracking. This can be found in 3′ x 5′ sheets at your local home center and comes in 1/4″ and 1/2″ thicknesses. We also recommend getting some good shims to set an even spacing between each tile. You’ll also need to get grout, which is available in sanded and unsanded varieties. Choose unsanded grout if your spacing is 1/8″ or less. Tiling can be a fun DIY project. But an experienced tile contractor can make the difference between a “good” outcome and a “professional” outcome. Another advantage in hiring a contractor is that you needn’t worry about miscellaneous expenses like renting a tile cutter, what type of mortar and trowel to use, or how many spacers you need. We can help you find local tile-installation professionals who can give you project cost estimates for your project. To estimate other flooring materials, visit our carpet or flooring calculators. inchcalculator.com is a participant in the Amazon Services LLC Associates Program, an affiliate advertising program designed to provide a means for sites to earn advertising fees by advertising and linking to amazon.com. Get hassle-free estimates from local tile professionals for your project.